This page serves to provide a short collection of thoughts about various aspects of web design and best practices. It will be updated occasionally over time. I originally added some of these to a Facebook business page, however Facebook is proving rather hopeless nowadays for reaching people as a business and somewhat counterproductive. I've spent most of today studying CSS code for styling web pages, but not just any old CSS code. Instead I've been concentrating on really lean code, so that only the bare minimum is added to the page for ruthless efficiency and fast loading. Very often you come across a web page that appears fine at first glance, but if you look closer you discover a plethora of errors, warnings and masses of unnecessary coding that is completely redundant. All of this clogs up your pages like a hamburger clogs up your arteries. Good coding is fast to load for web browsers and easy for search engines to understand, so it also benefits your SEO. Good coding is a work of art. After studying this site I just ran an online speed test to see how it performs and it's clear that lean code, properly optimised images and a fast web server all make a difference. I have done a lot of photography over the years, stretching back long before digital started. Art directors love images with plenty of clean space because it gives them options to crop closer or place graphics to perfect effect. Designing a website is not so different and I always start with a blank white page. I love empty space on a web page and contrary to what some might think this is not a lack of design, but rather allowing the design to breath. It creates a much better viewing experience for the visitor when elements are clearly separated, rather than crammed into a small area as a jumbled mess. Open spaces also allow room for clear, large fonts that are easily legible and creates a trust signal that improves the standing of your brand when everything is presented in a clean design. Whenever I arrive at a busy web page that has no clear purpose I generally leave within 5 seconds. Whenever I arrive at a page where the site owner clearly doesn't care about the viewer experience I also leave. In some ways it's not rocket science, however knowing when to stop is perhaps the greatest asset of any designer. Incidentally, it's also why you should hire a designer who understands these things. You start with a perfect clean page, so be careful before you mess it up. It's not unusual for people to hire a web designer or try themselves, only to discover after a lot of work that it looks completely different online than it did on their computer, which can be frustrating and difficult to troubleshoot. Since the 1990's web designers have hurled abuse at Internet Explorer in particular, which seemed to work in a parallel universe and require separate coding, though I'm glad to say problems are less common these days. Most of the time a local host server like MAMP should indicate how a site will appear online. There are limits though to what this can achieve and it certainly won't tell you if there is something wrong with the setup of your chosen web server. A lot of people spend a great deal of time and money building a site, but then simply opt for a cheap shared hosting plan believing they are all the same. You may be lucky, but equally it could open up a world of pain and frustration. All of this is really just a way of explaining that your choice of web host is important and has an impact on your business, since slow speeds and downtime can affect both your direct sales and SEO ranking. Having a big burst of traffic only to find your server falls over because of limited resources is major false economy. 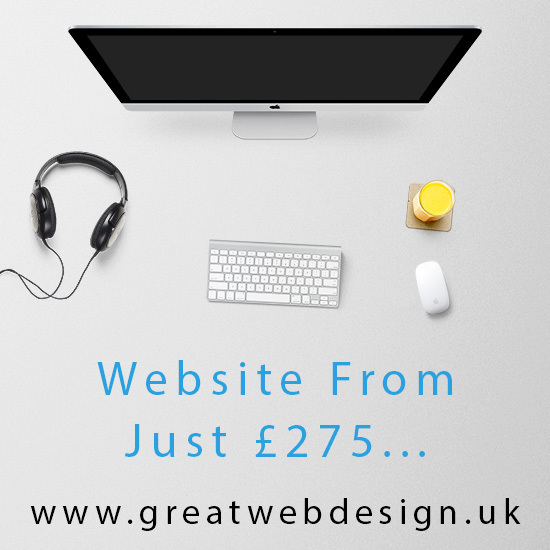 It makes sense to choose an option that is fast, reliable and compatible with your websites. I am happy to assist customers in choosing the right web host when I design them a website and deal with these points, so you simply order your design and watch your business grow. For most small businesses a basic shared hosting plan is adequate and I generally recommend Kualo. Something I think about quite often is the choice of font, which can completely change the perception of your business when a visitor arrives at your website. There is very rarely a good reason to choose Comic Sans, but something like Gotham or Museo Sans creates a very professional impression. At one time we were stuck with half a dozen web safe fonts like Verdana or Geneva and the internet was a pretty dull place. Nowadays the choice is vast, including many that are free, so there is no excuse for simply using any old font without a bit of thought. There is a huge amount that can be learned about fonts, but the easiest option for many will simply be to opt for Google fonts. These are completely free and offer many choices that are close in appearance to some very expensive fonts. There are also alternative services offering access to a huge range of stylish licensed fonts for just a few pounds a month, but without getting too technical my preferred method is to use web format fonts that are hosted on the server, then cached around the world on a CDN for extra speed. Web fonts come in various different formats, so I use a rather neat system that automatically serves the fastest loading version that a browser can handle. This means that a modern version of Chrome should download Woff2, while Internet Explorer would download the slower Woff format. Both should look identical though. This system ensures there is no faux rendering flash as the page opens or delays in connecting to external services. I hope the message from this is that there is a lot more to web design than simply placing a few pictures and a bit of text on a page before hitting the publish button. Responsive websites represent a step change in the way that websites are designed, bringing them into line with the reality of modern web browsing. In essence, they reformat instantly to fit the size of the visitor’s screen; providing a better browsing experience for the viewer. If you went back to 2009 less than 1% of web traffic occurred on mobile devices but fast forward to 2016 and that figure has risen to a staggering 40% globally. It’s even higher in the UK. More importantly, it is set to grow every year for the simple reason that we now use our smartphones and tablets like iPads, rather than sitting chained to a table with a big desktop computer. Many people no longer need a traditional computer for online banking, social media or making purchases. If you still have a website that isn’t mobile friendly there is a good chance that visitors will leave immediately, but that is assuming they will even find it, since Google now penalises websites in their rankings if they are not mobile friendly. There are of course designers who build one page for mobile and another for desktop, however this is an outdated approach in my opinion. First of all it requires updates on two separate versions, carrying greater risk of errors, such as spelling or worse. More importantly it only works reliably on two fixed sizes and there is too much device variation nowadays for this to work effectively. There are various options for creating responsive websites and this site was created using Foundation, however there are other valid alternatives, such as Bootstrap that I also use. I do not recommend WordPress though, because it has more security holes than a piece of Swiss cheese and they are a pain to maintain due to the necessity for constant plugin updates that often break things. If the time has arrived when you need a responsive website with modern, SEO friendly coding, why not check out my website and contact me if you have any questions.